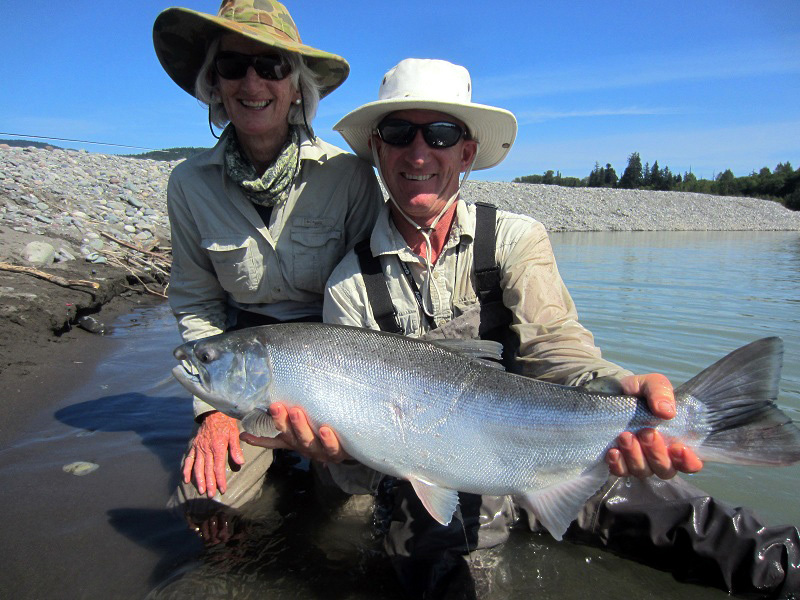 Our season is now drawing to a close but it has been a great year. 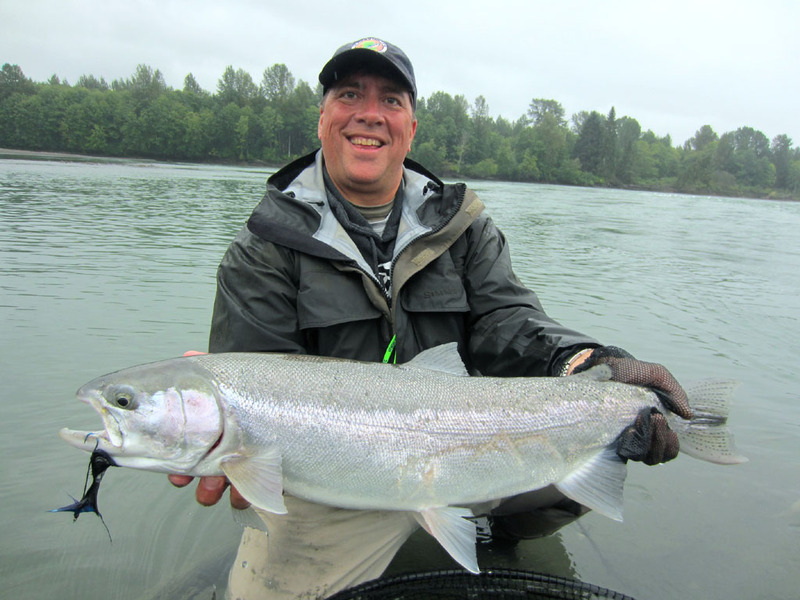 For the last few weeks we have been out on several rivers fishing for Steelhead and Coho. 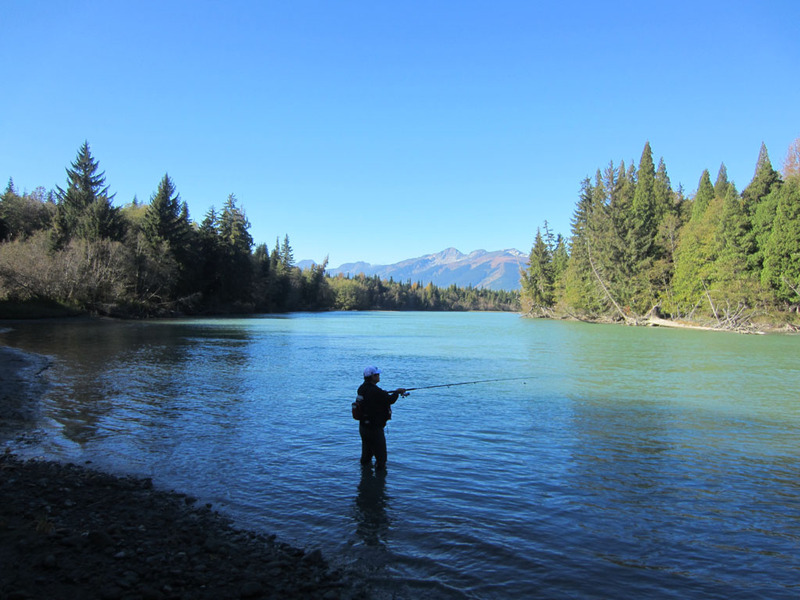 Having our private boat launch on the Kalum River means we are casting lines into the water just minutes after leaving the lodge. Our guests Ed Scherer from Seattle and Shinichi Hoshino from Japan had some fun days fishing and landed nice Coho and trout. 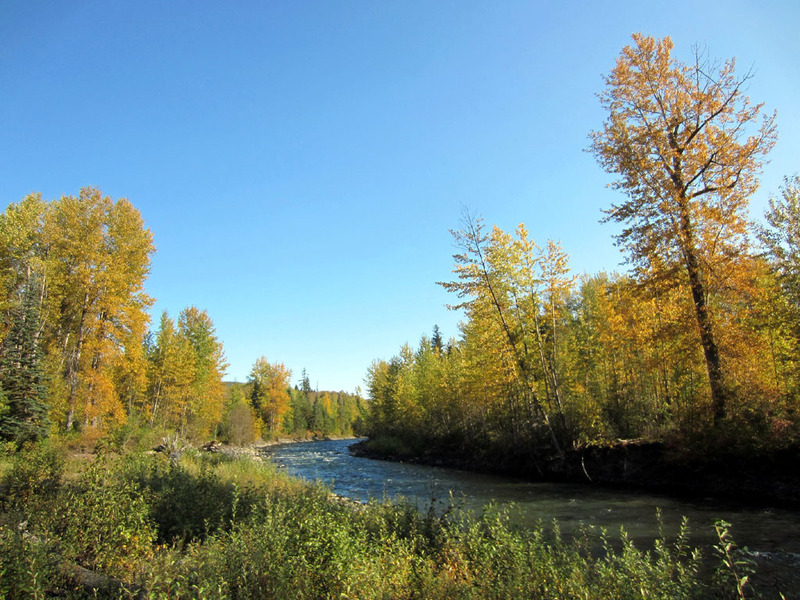 The scenery out on the rivers is spectacular with the autumn colours. 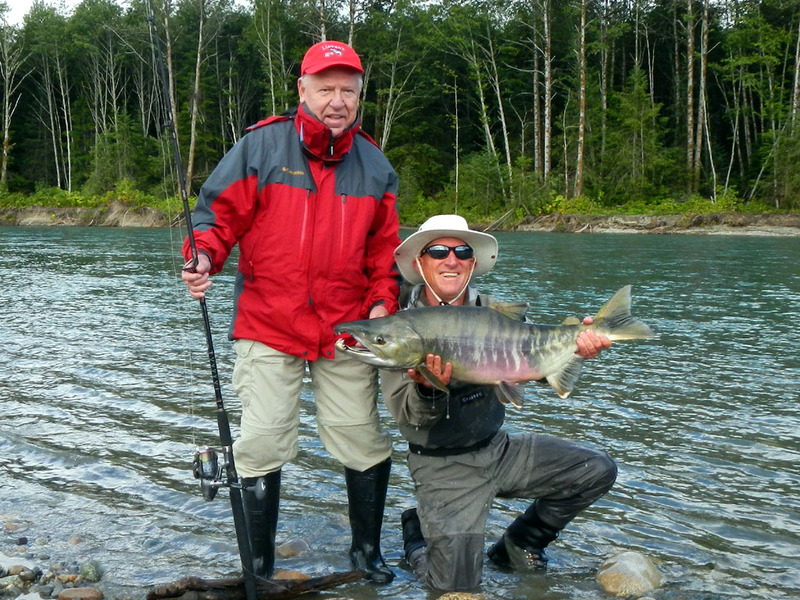 Our guests from Argentina enjoyed a week’s fly fishing on the Skeena, Kalum and smaller northern rivers. 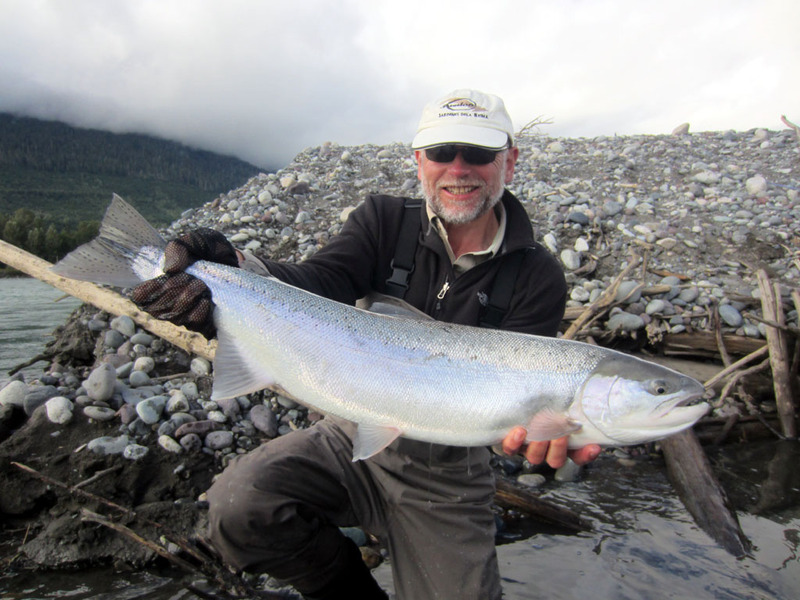 They hooked good numbers of fish every day and landed some super Steelhead, Coho and Dolly Varden. 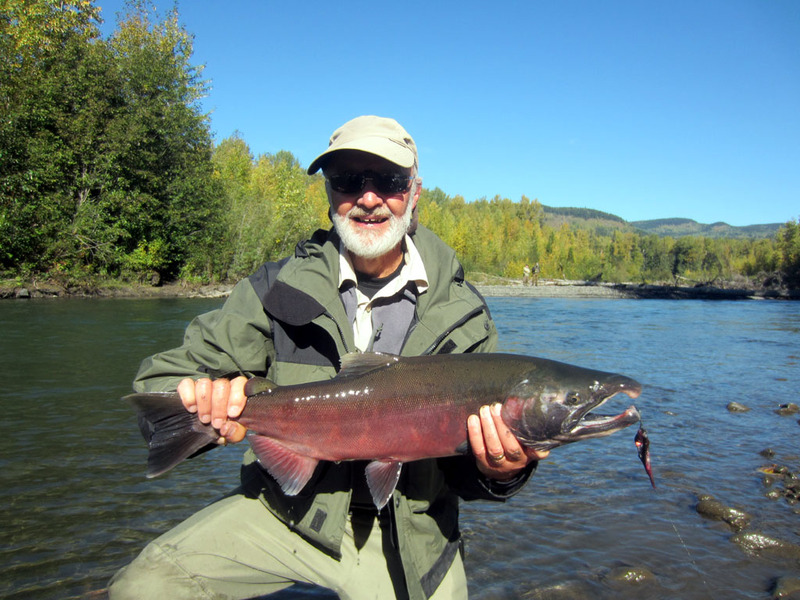 Autumn is upon us and at this time of the year we start to fish the Skeena tributaries and other pristine wilderness rivers. This week our intrepid anglers, Alan, Geoff and Bruce from England, spent some super days hiking along small unfished rivers amidst the beautiful forests. 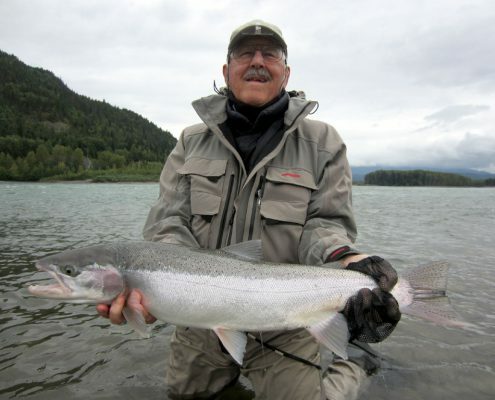 Casting their flies into pools that have not been fished before they hooked into some lively Steelhead and Coho. 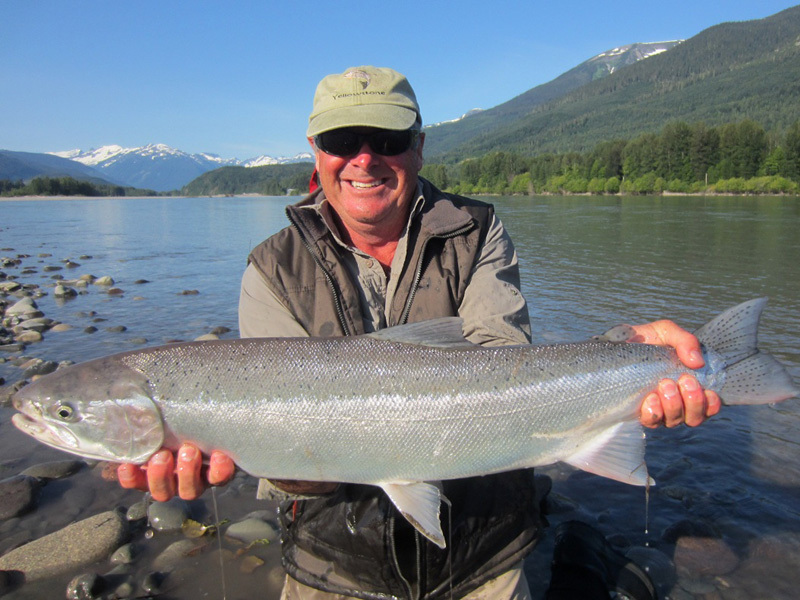 We’ve just had a great few days fishing with a group of nine anglers who all belonged to a Vancouver fishing club. 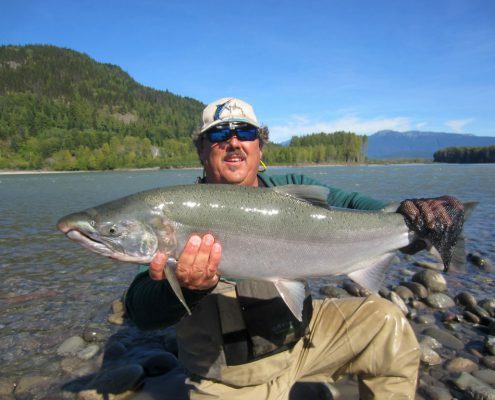 The guys landed Steelhead, Coho and Dolly Varden from the Skeena and Kalum rivers. 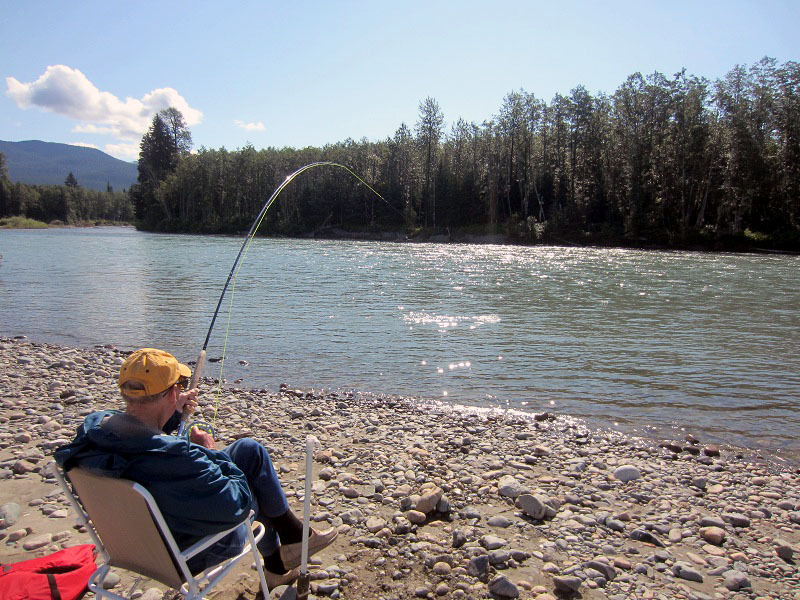 After a long day on the river, they sat out on our deck in the evening sun and swapped fishing tales over a beer or two. 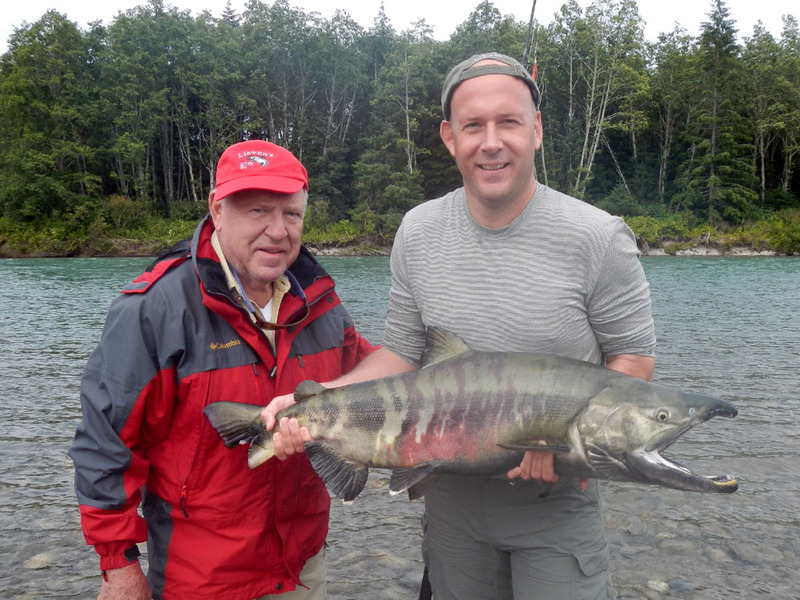 Clyde Weston from San Diego has been fishing the rivers in the Terrace area for several years with his son Greg. 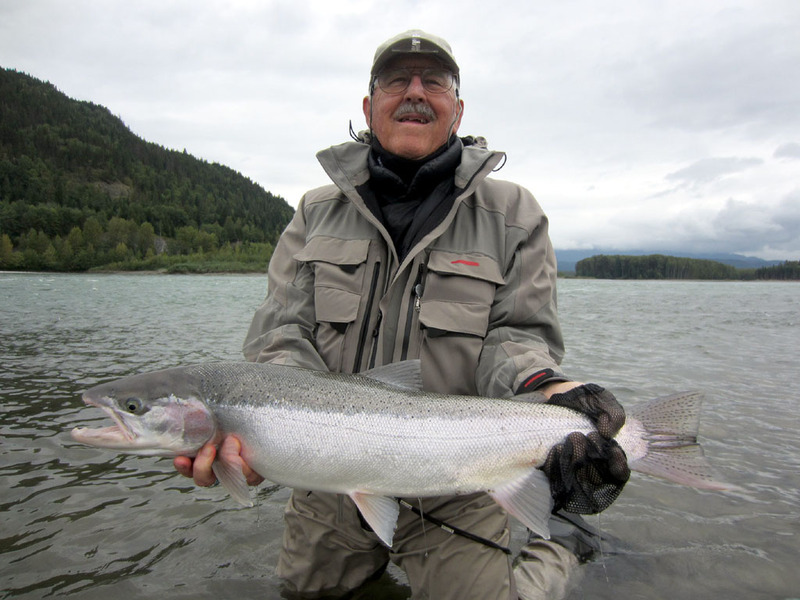 He told us that he had been fly fishing all his life, that he was 76 years old and had never caught a Steelhead on the fly. “Well its about time you did” we replied!! 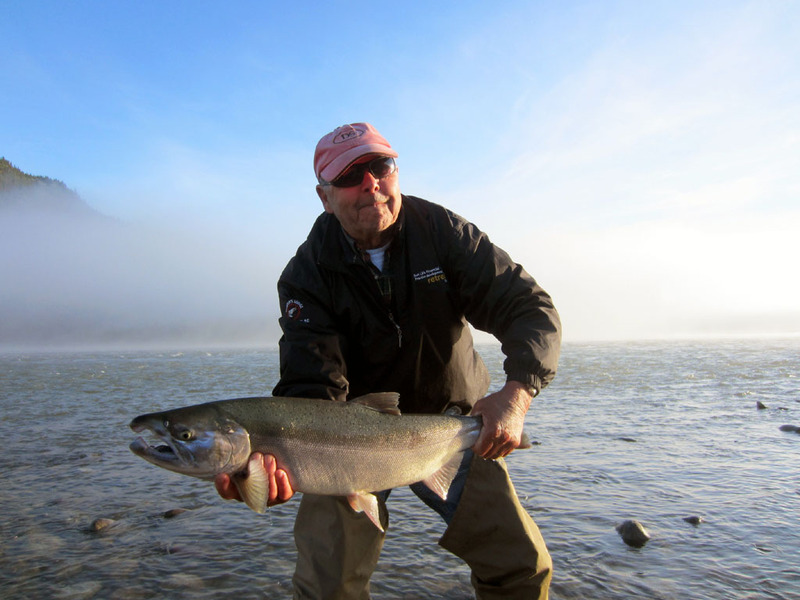 One misty morning Andrew Rushton took them out on the Skeena River and as you can see from the photo Clyde landed his first ever fly caught Steelhead. It was a powerful fish that jumped several times as it headed down the river taking most of Clyde’s line with it. 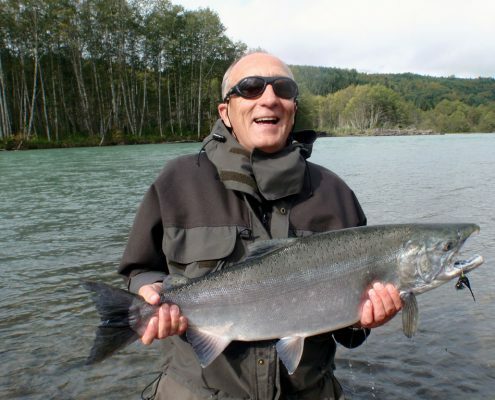 Clyde was thrilled with his catch. 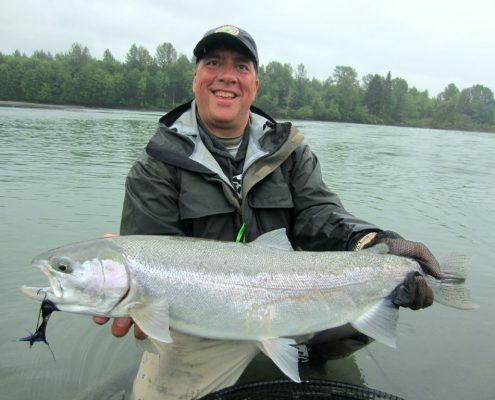 Greg landed this large Coho as well as Steelhead. 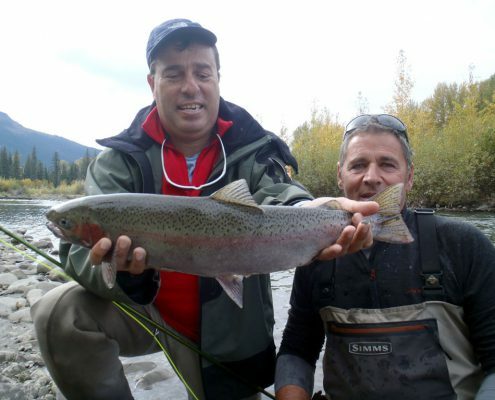 Well done guys!!! 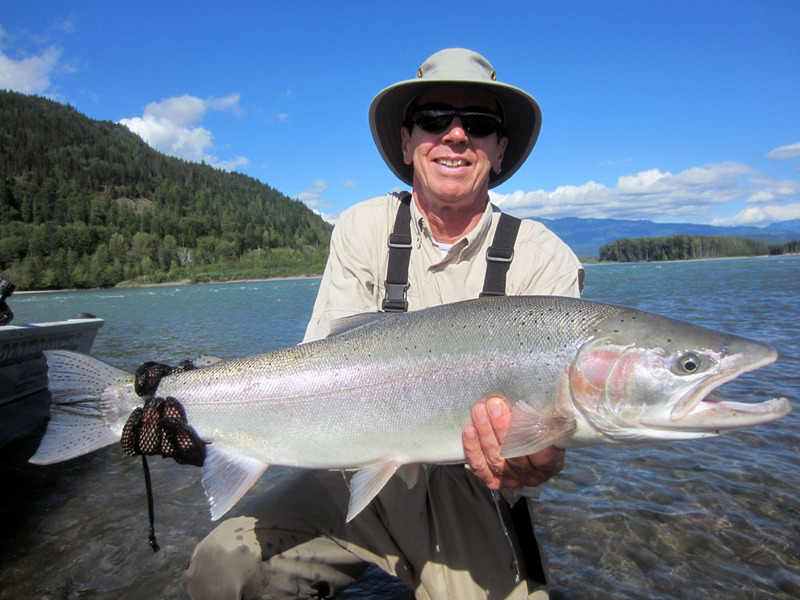 Sunny skies, silver fish and big smiles!! 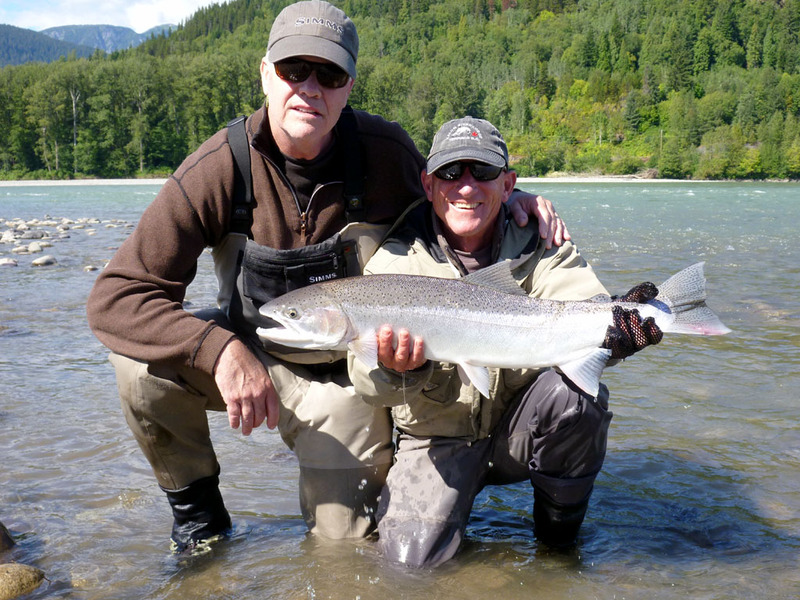 Our fly fishermen from the UK had some good fishing on the Skeena and Kalum rivers. 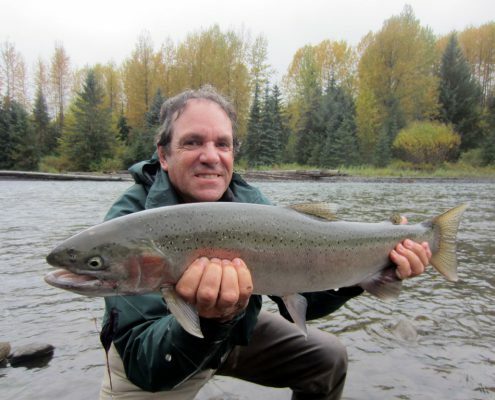 Here are just a few of the Steelhead, Coho and Chum that were landed. 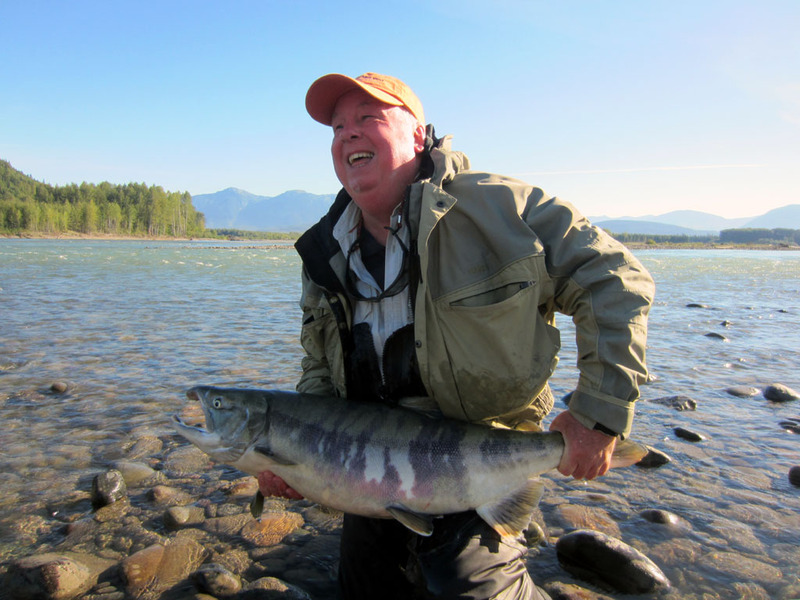 “A superb time had by all” Brian wrote in our guest book. Thanks guys for a great week. 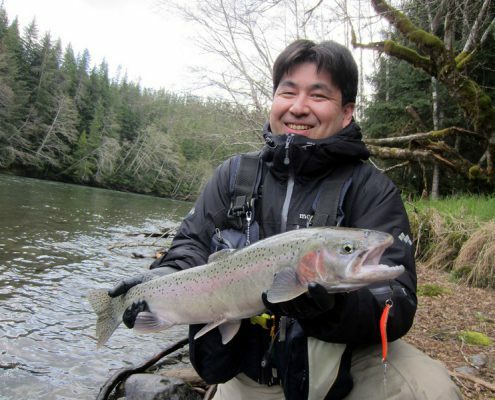 “Kalum River Lodge is very famous in Japan” Yuta Fujiwara told us. 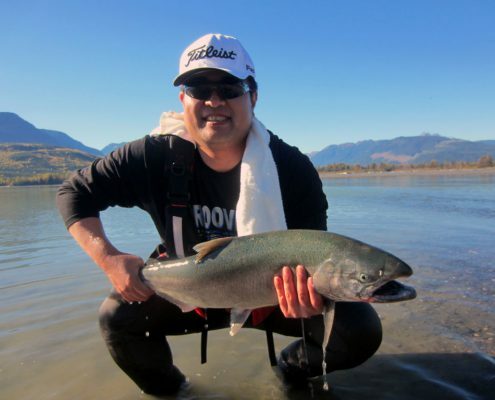 He had watched us guiding Japanese anglers on several fishing TV programmes in Japan, so he was very excited to fish with us for a few days. 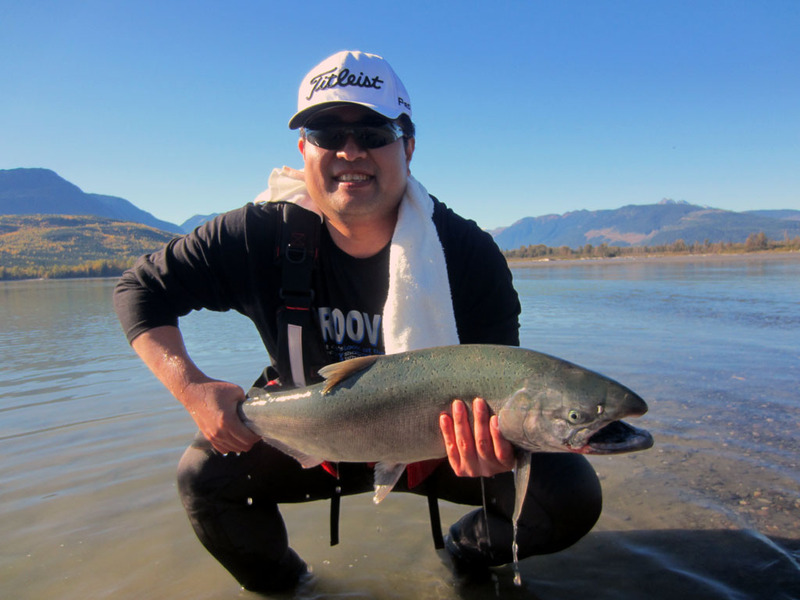 Yuta had a great time fighting Steelhead and these powerful fish had him running down the bank as they took most of the line from his reel! 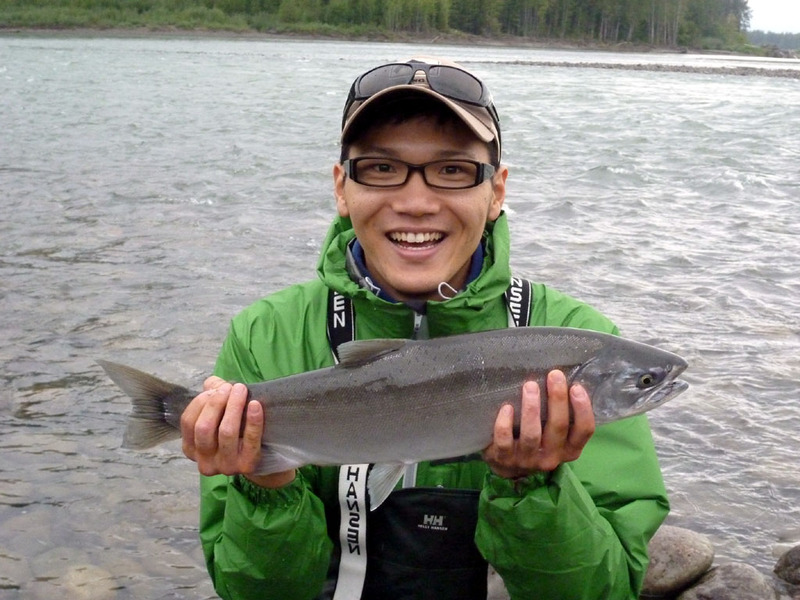 As you can tell from the photos Yuta was very pleased with his catches. He landed Steelhead every day along with some nice Coho. 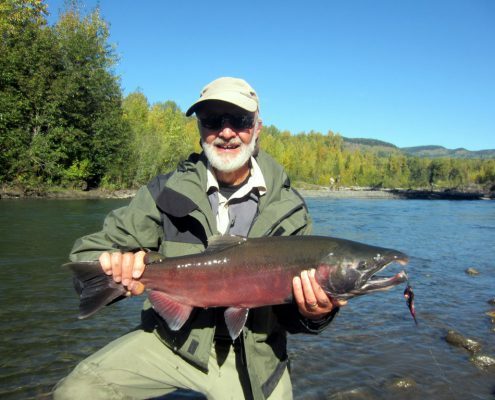 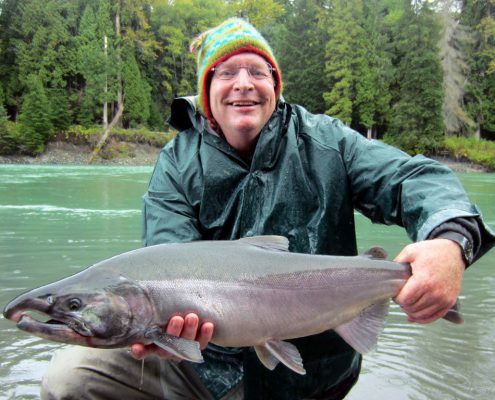 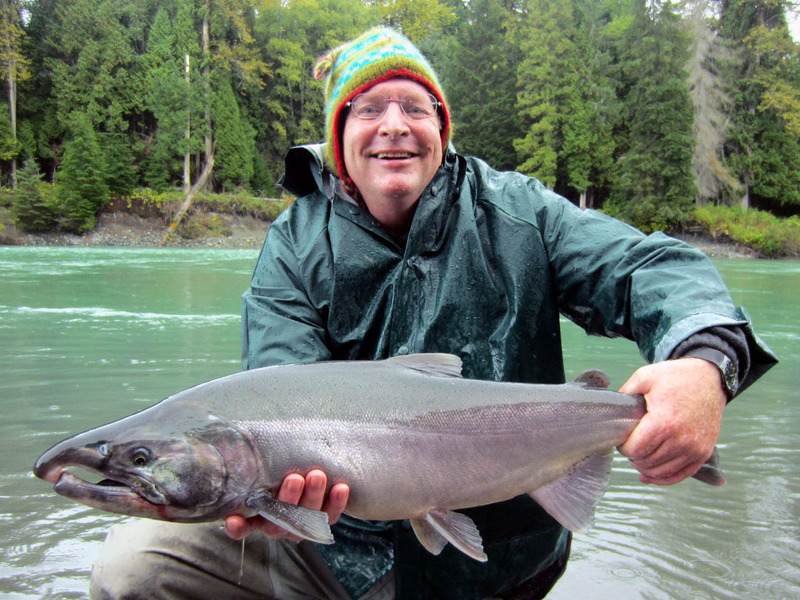 One of our other guests, John Popich from Seattle, also had many battles with large Steelhead. 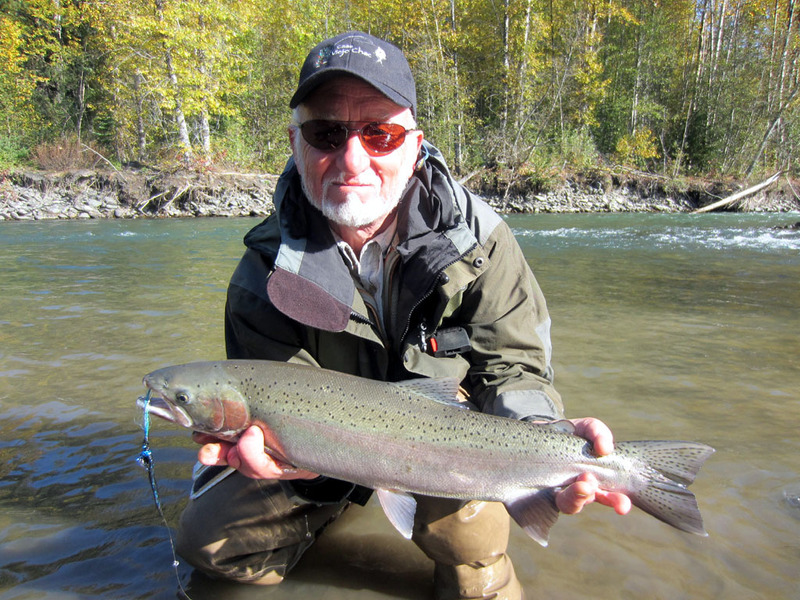 John was thrilled to land this Steelhead on his spey rod. After fishing for two weeks with us Marcus Ervin caught a lot of fish. 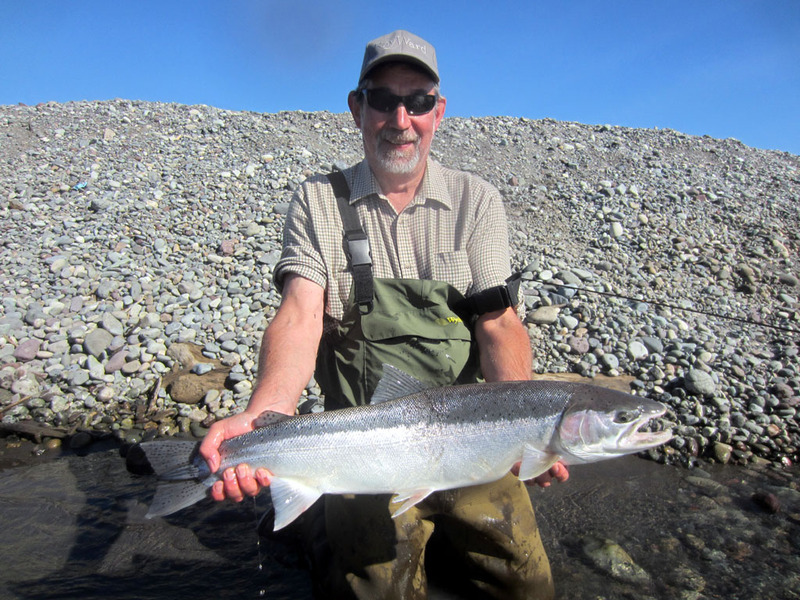 On his best day ever he landed seven Steelhead along with a number of salmon. 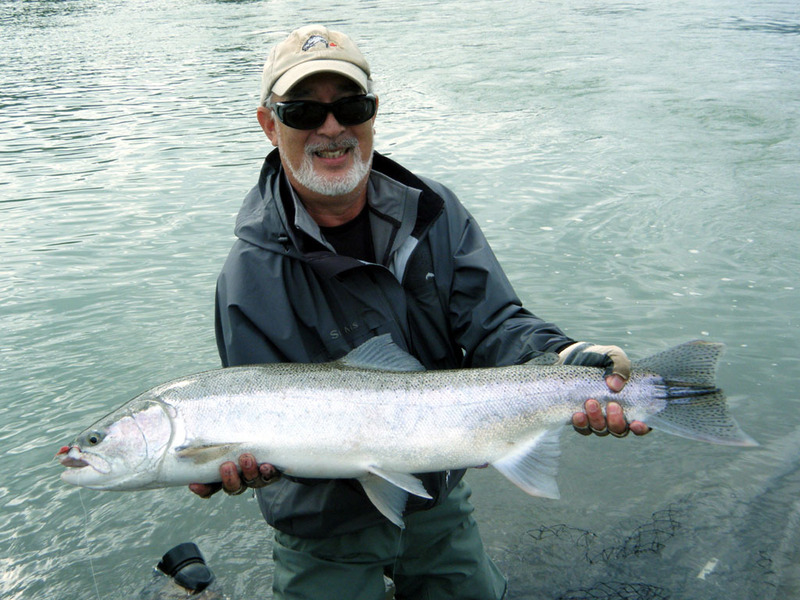 It is a great time of year to fish here as there are all the species of salmon and Steelhead in the river. 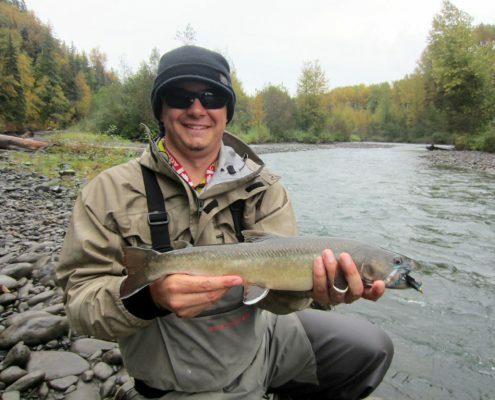 Thomas flew in again from Germany for his 4th year at Kalum River Lodge. 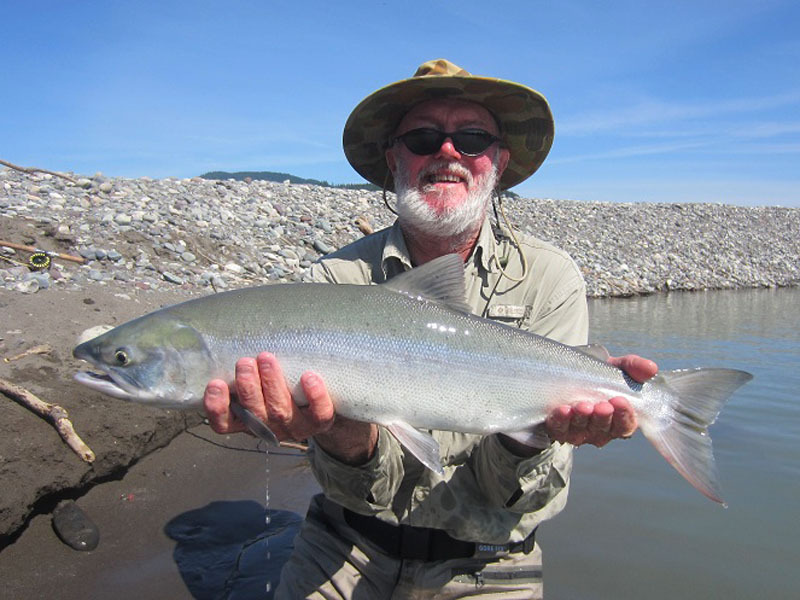 In the first week of his 10-day trip he caught some super Steelhead, large chum and several Coho, Sockeye and Pinks. Thomas landed more Steelhead in one day than Marcus. 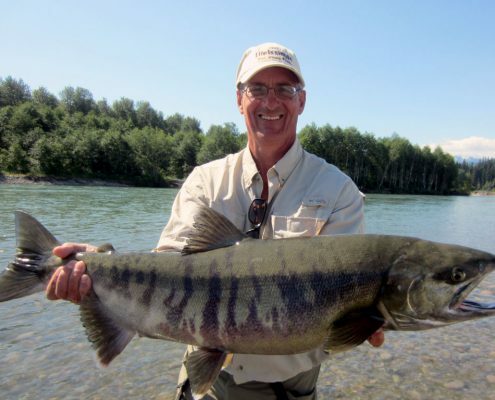 However, Marcus said he would be back next year to beat his and Thomas’s personal records!! 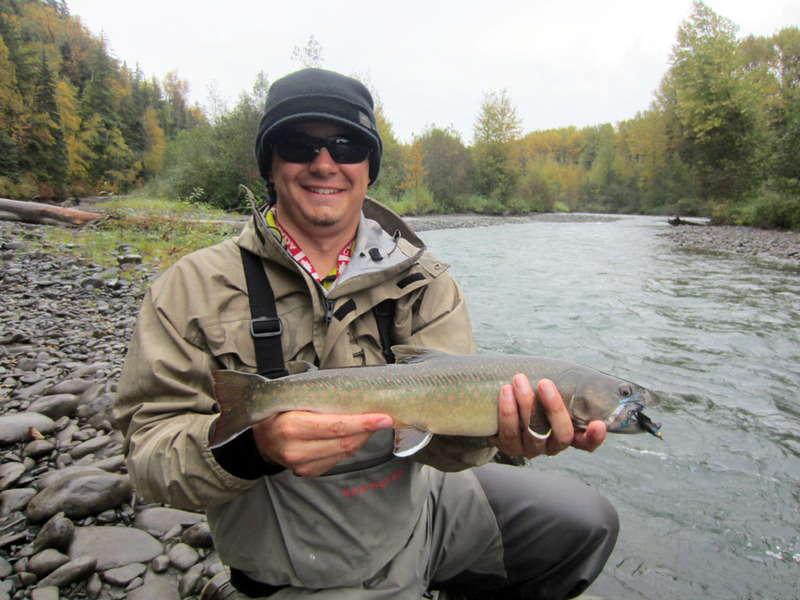 Clay Kangera from California joined Marcus and Thomas for his first time fishing the Skeena. 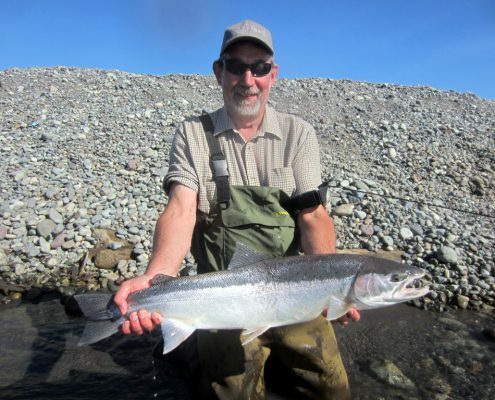 He enjoyed his time fishing with the other guys and was very pleased after landing several silver Steelhead and salmon. 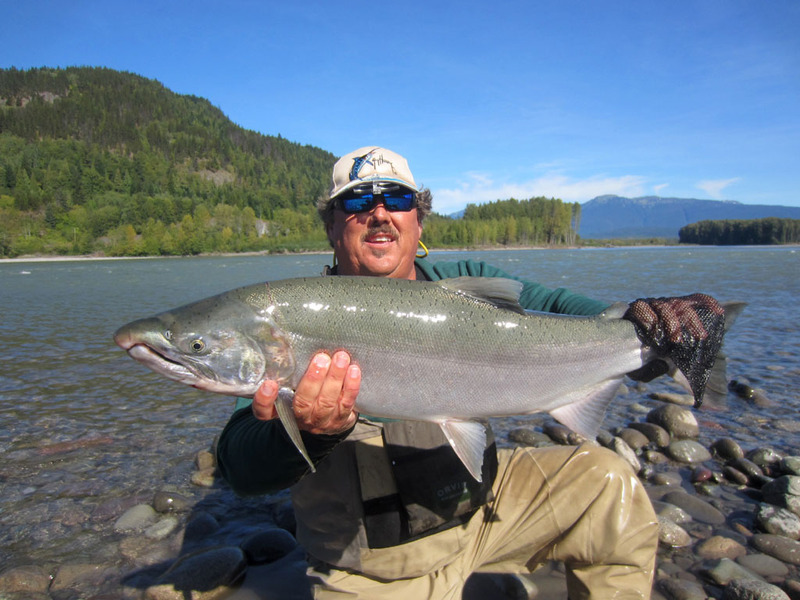 The Skeena River is in good shape and our guests are catching lots of Steelhead, Coho and Pinks. 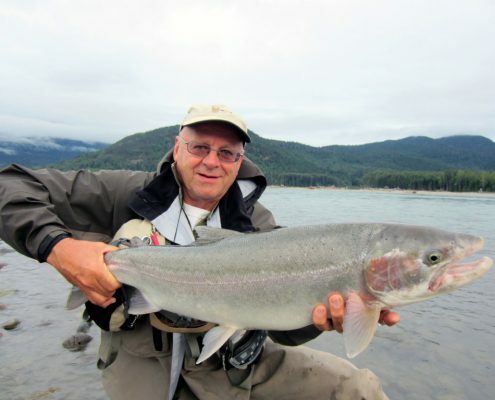 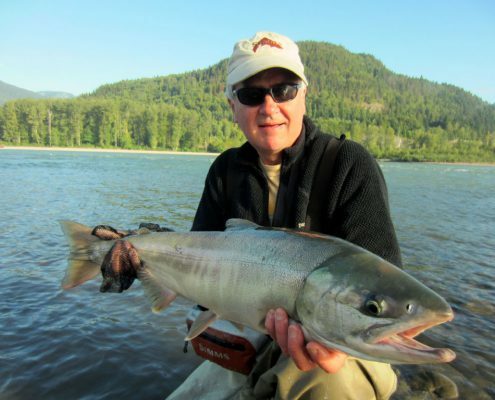 In the last few days Doug Gosling from BC has landed six Steelhead along with other salmon. 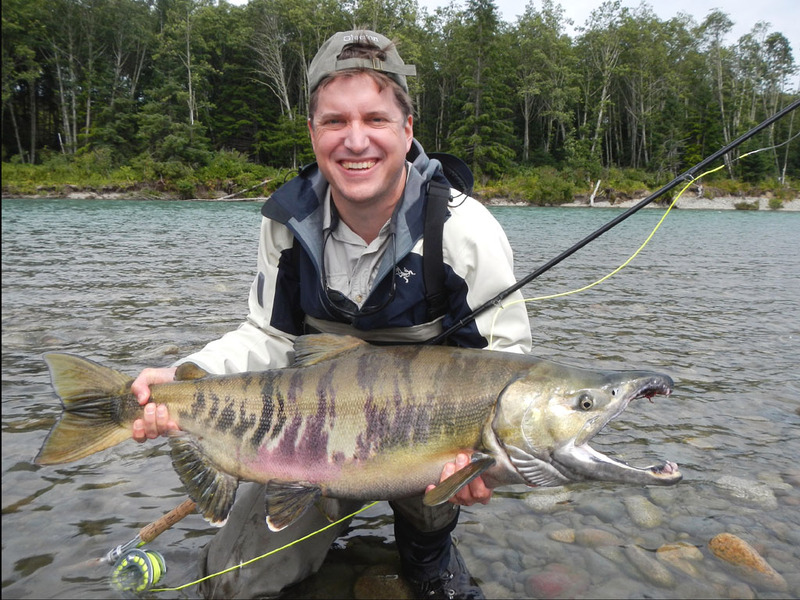 It is his first time fishing the Skeena and he is pretty happy. 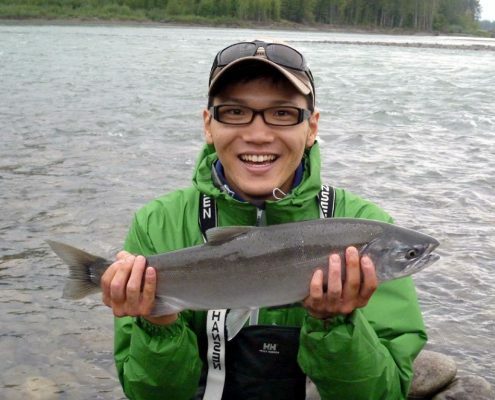 Sadly he is leaving today but will be back next year. 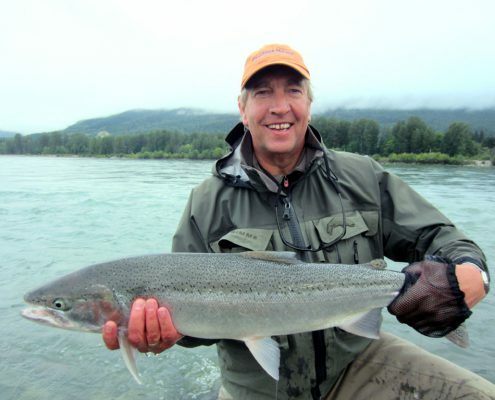 Marcus Ervin has returned for his 7th year at Kalum River Lodge. Marcus has caught a lot of fish from the Skeena over the years and is a familiar face on our website!! 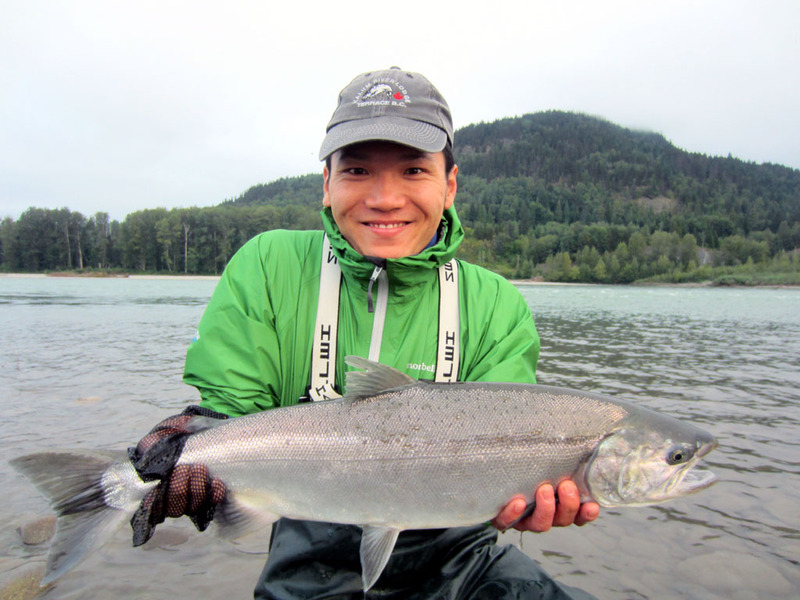 Here is Marcus with a lovely fresh Steelhead he caught yesterday. 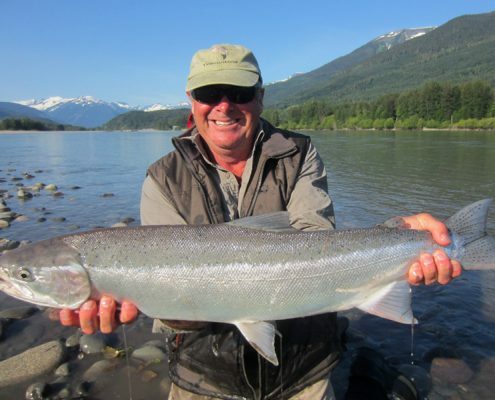 This weeks guests from the UK, US and Canada have been catching some super Steelhead. 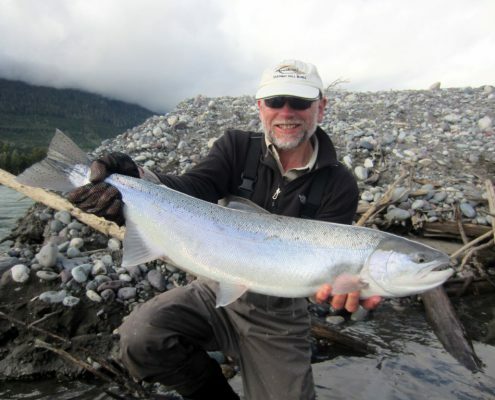 Ray McClenathan from Oregon landed this beauty on the fly from the Skeena yesterday. 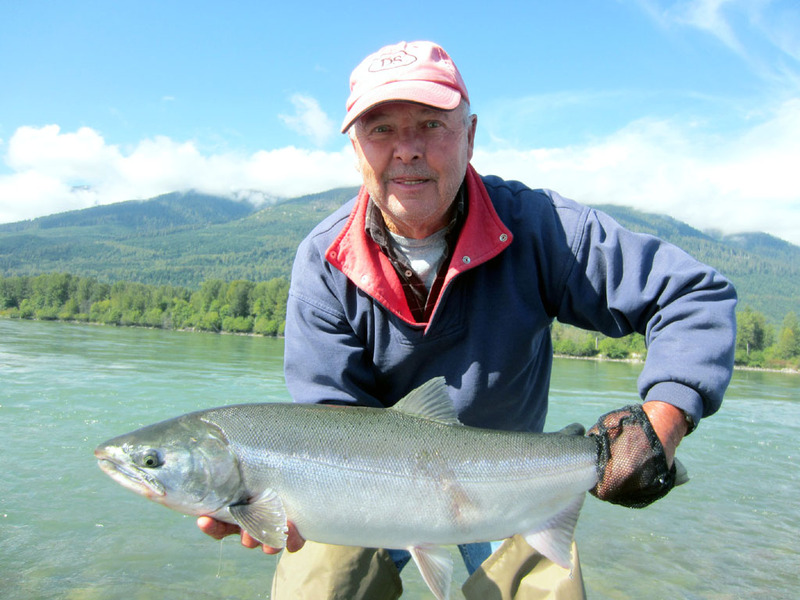 We have also been catching good numbers of Sockeye and Coho. 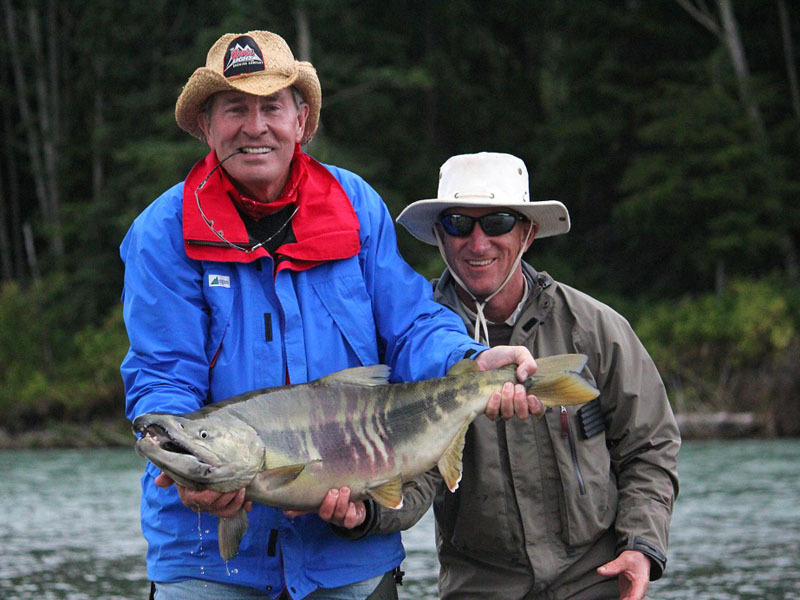 More photos to follow soon!! 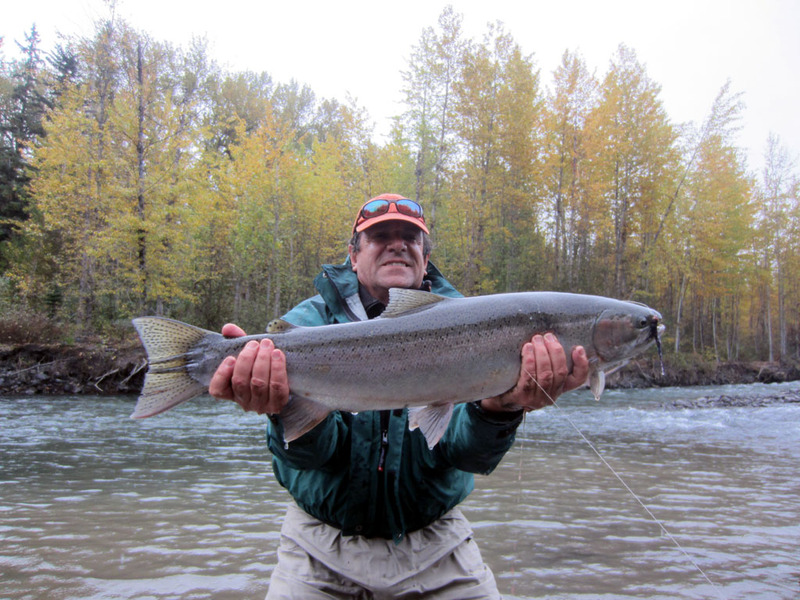 Our Steelhead season is now fully underway. Dave and Annella from Australia have returned for another season along with two friends. 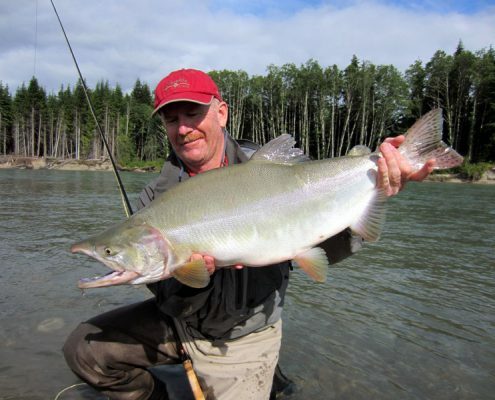 Everyone has been busy on the Skeena River fighting some large Steelhead – their Spey rods have been getting a good workout! 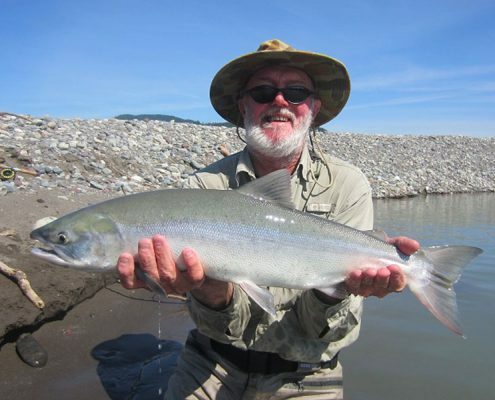 In the last two days they have landed a number of fresh silver Sockeye and Coho, as well as Steelhead. 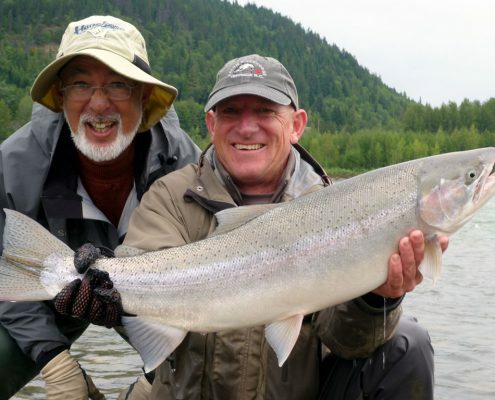 And they still have another three days fishing to go! 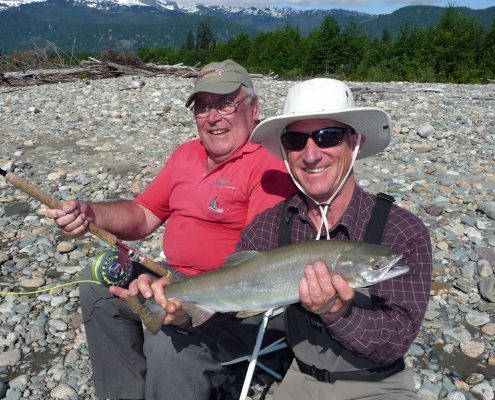 For his 80th birthday, Lieven Van Riet’s family treated him to a fishing trip with Kalum River Lodge. 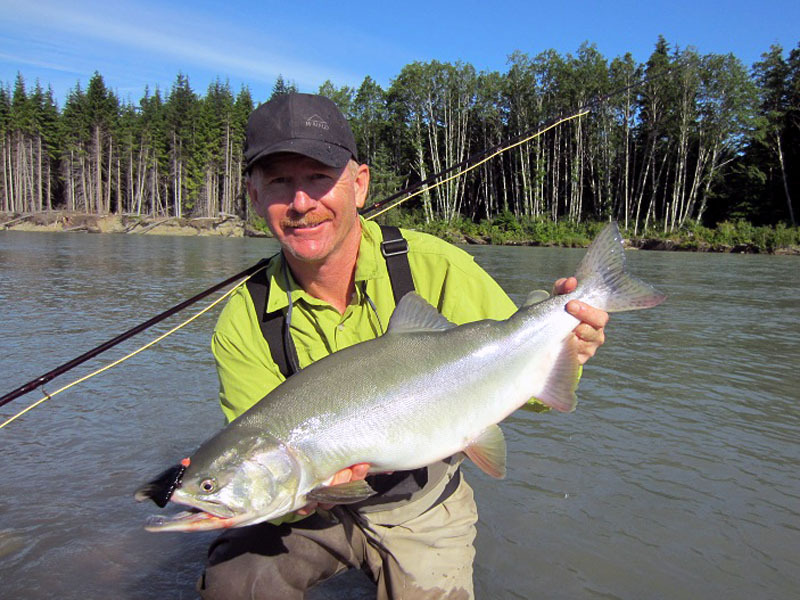 Lieven along with his two sons Chris and Gleeson, friends and family travelled up from Texas for a few days fishing. 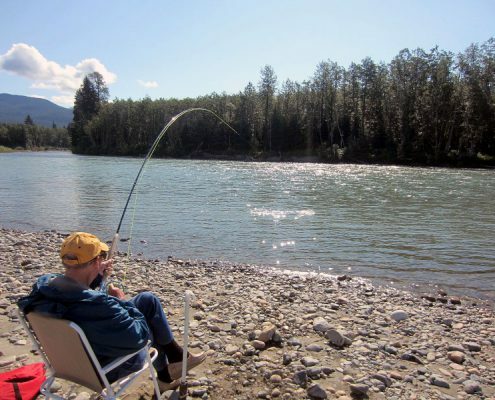 The guys enjoyed drifting down the beautiful Kitimat river amongst the superb mountain scenery. 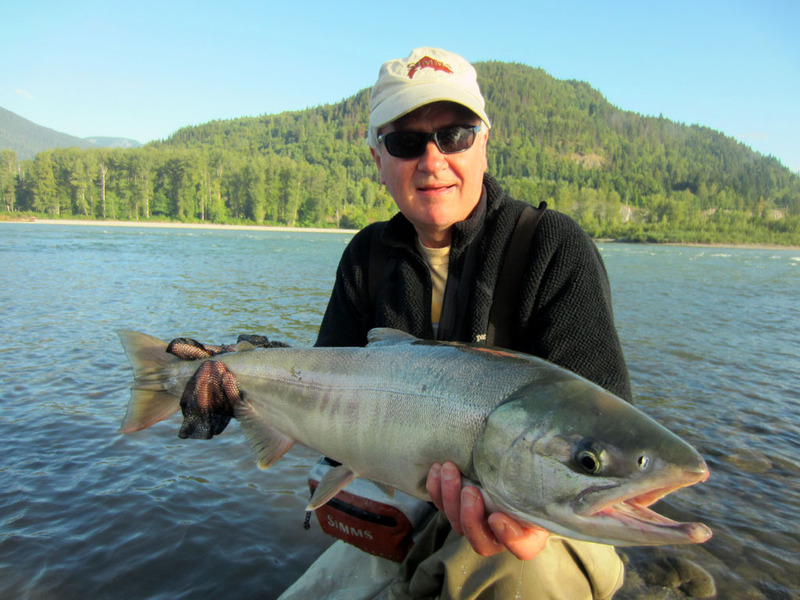 Everyone had great fun fighting some strong Chum salmon. 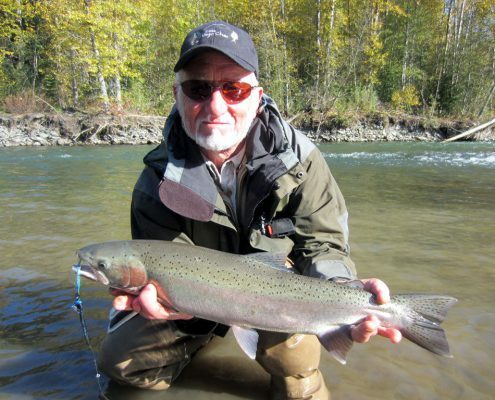 What better way to celebrate a special birthday?! 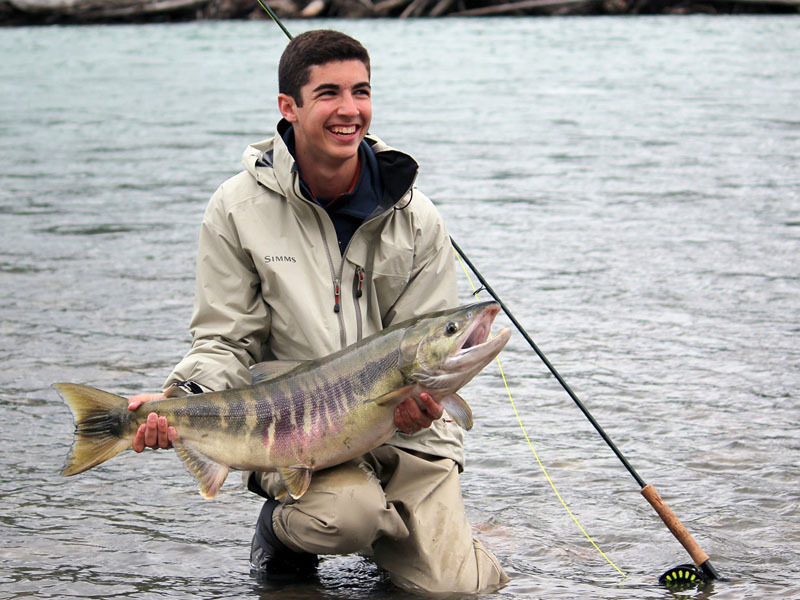 After an exciting weeks fishing with us last August, Matthew Wiener said he “would definately be back”. 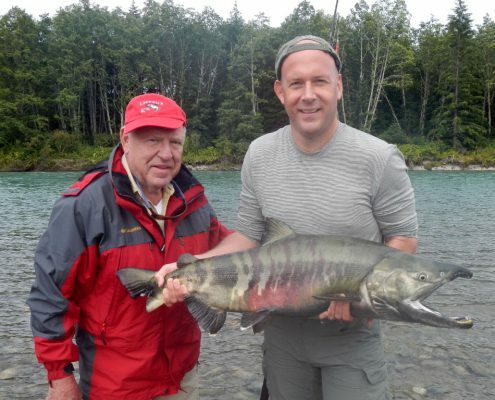 And true to his word Matthew returned along with his cousins Alan and Peter Rush. 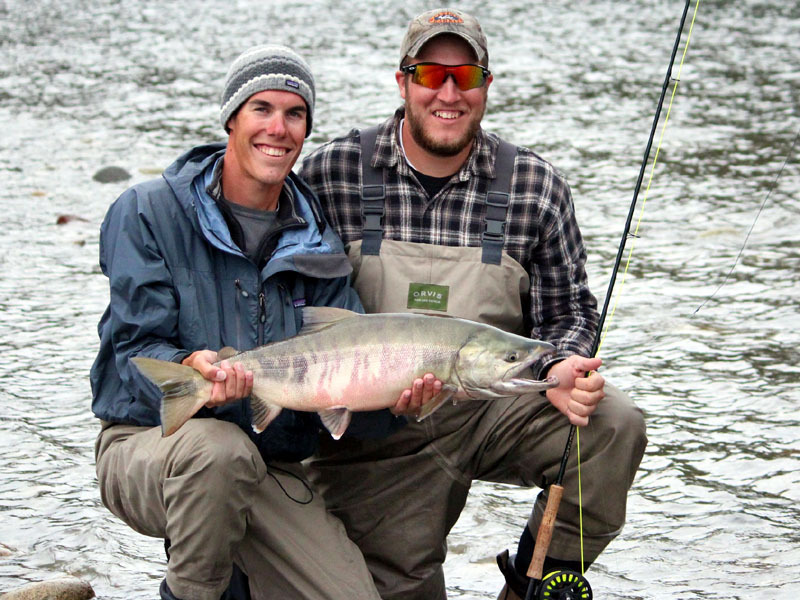 For the Rush brothers it is their third season fishing with Kalum River Lodge. 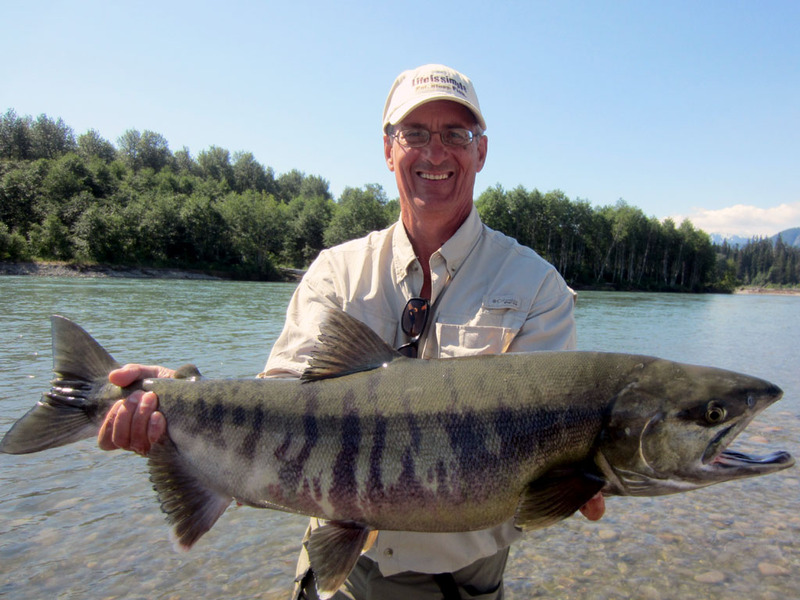 The guys fished the Skeena and Kitimat rivers and caught a lot of large Chum salmon. 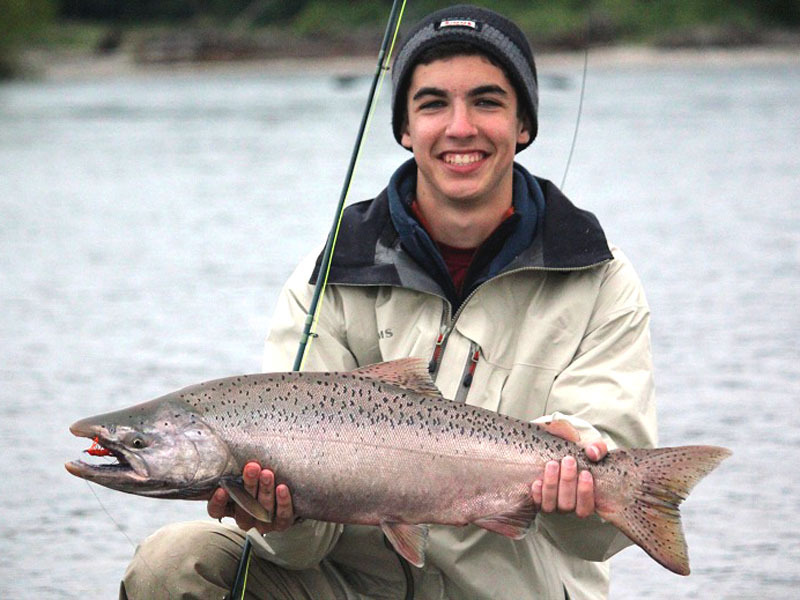 Matthew was very happy when he landed a super Chinook salmon on the fly. 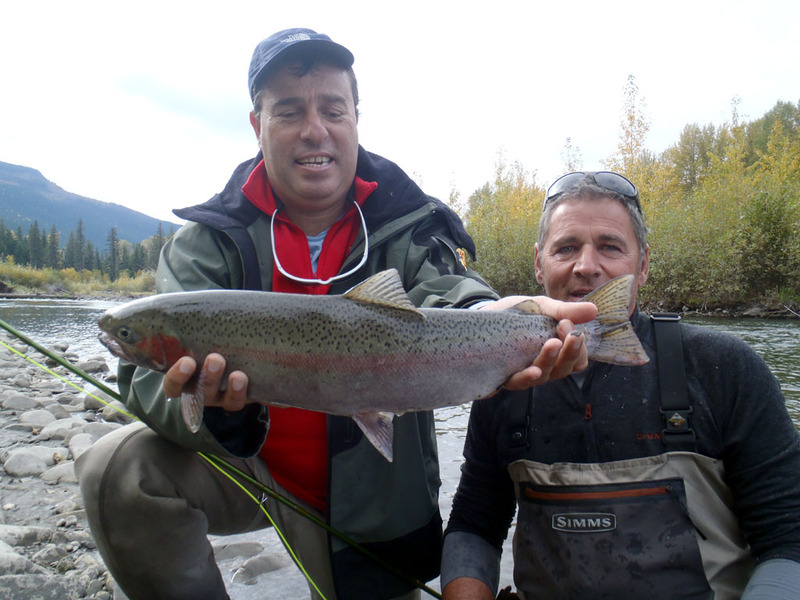 The guys were joined by Randy Ward who travelled from Calgary for a few days fishing and had great fun fighting 28 salmon in one day! Here are just a couple of the large Pink salmon that guest Patrick Brennan from Australia landed during his stay with us. 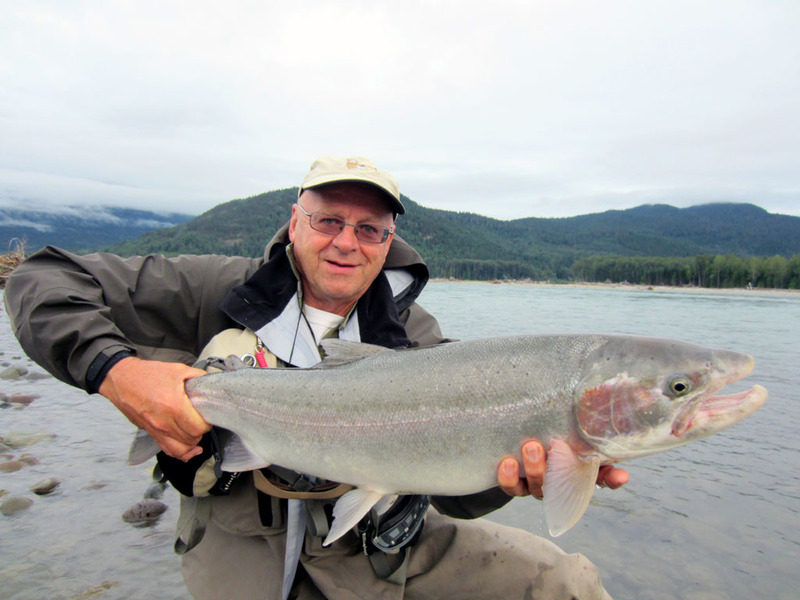 These fresh silver salmon gave Patrick a good fight on the fly rod! 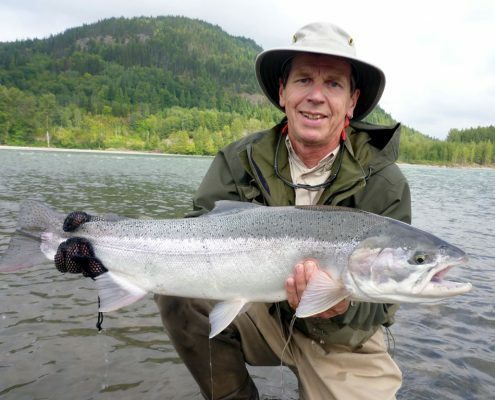 This is a great time of year here for catching a variety of salmon. 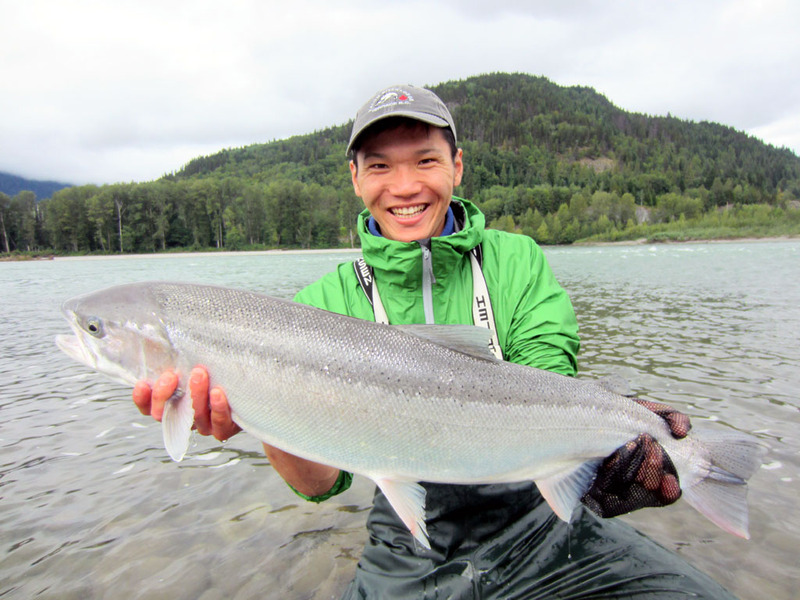 Here are some photos of our last guests who caught Chinook, chum and pink salmon. 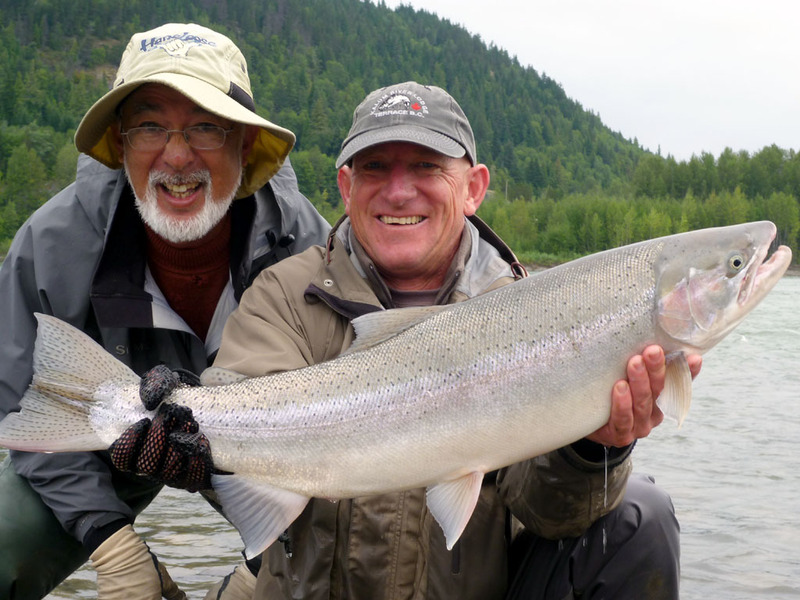 Mike and Terry treated their fathers to a few days fishing and all the guys hooked into some large salmon – some were landed and some got away. 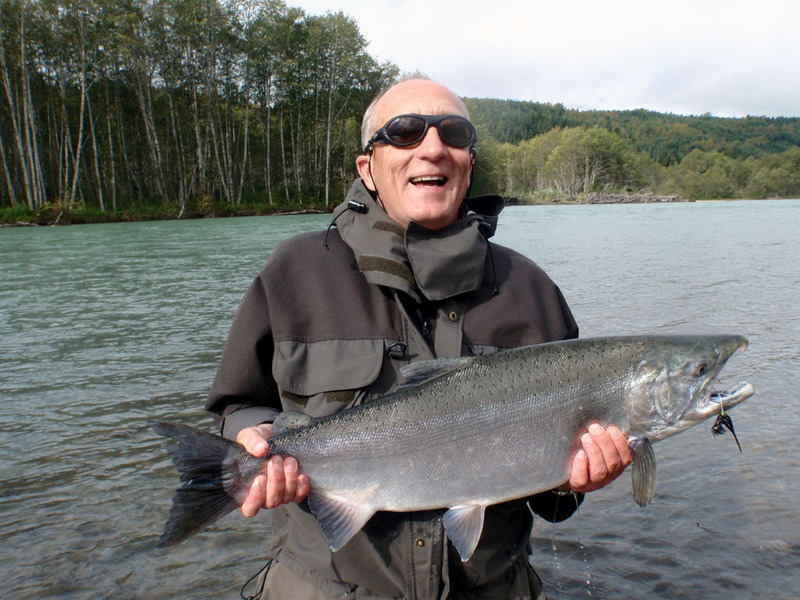 Terry’s father Philip at 92 years old is Kalum River Lodge’s least youngest fisherman, but this did not stop him wrestling a few salmon whilst relaxing on the bank! 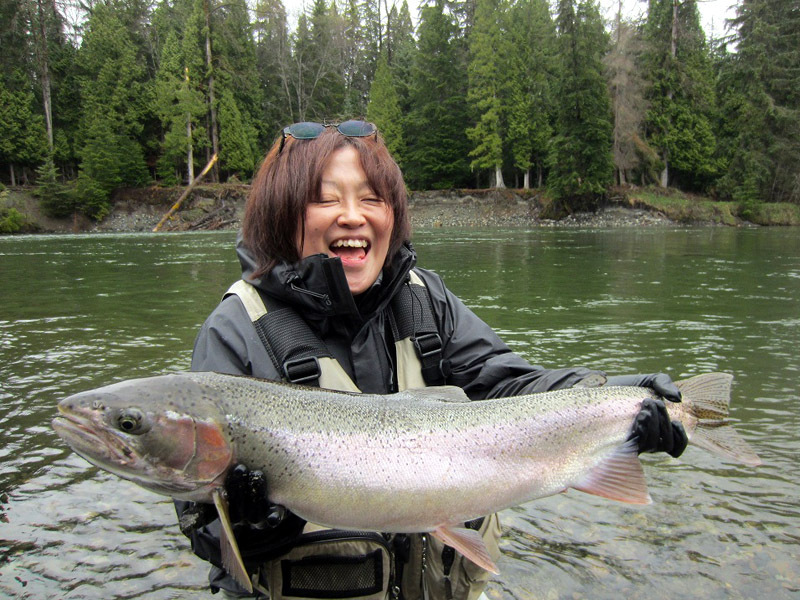 “The smiles say it all…..” Here are Osamutaro and Chika with some of the fish they caught during their trip. 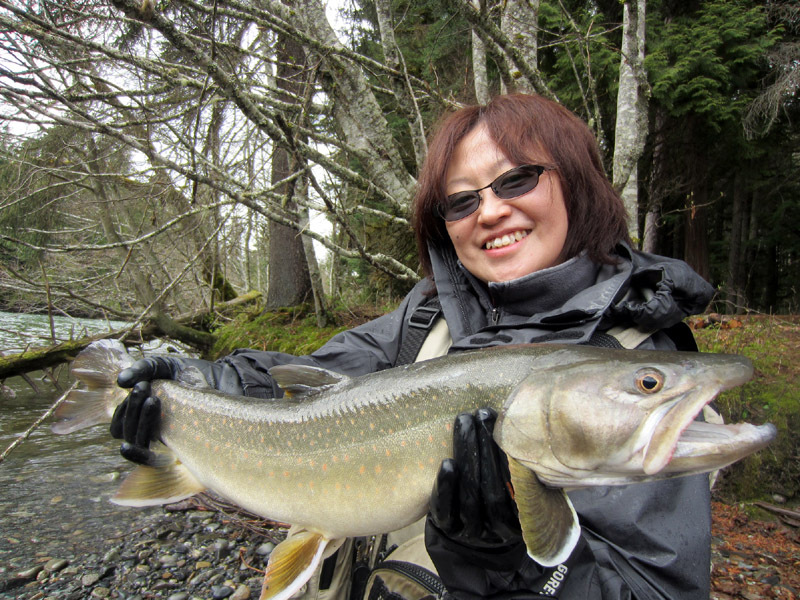 Chika caught Steelhead and landed several large Char. 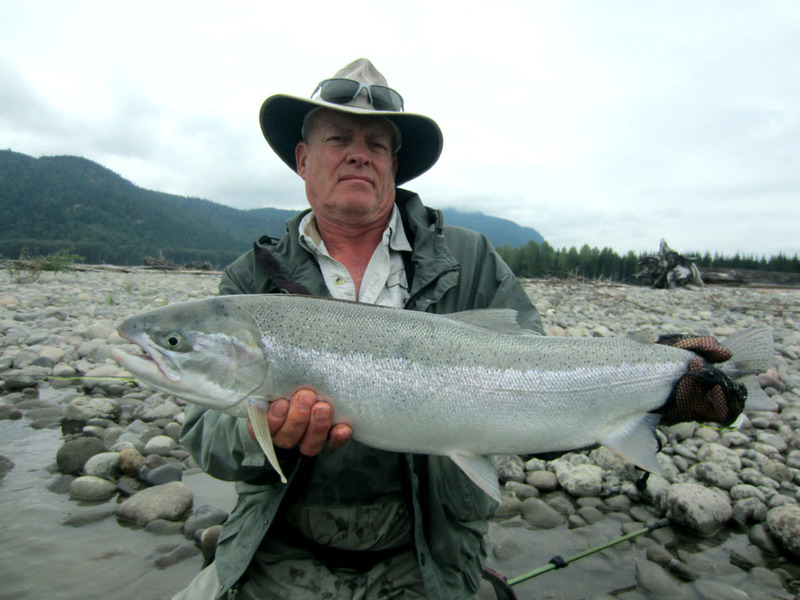 Kalum River Lodge’s spring Steelhead season is now winding down. 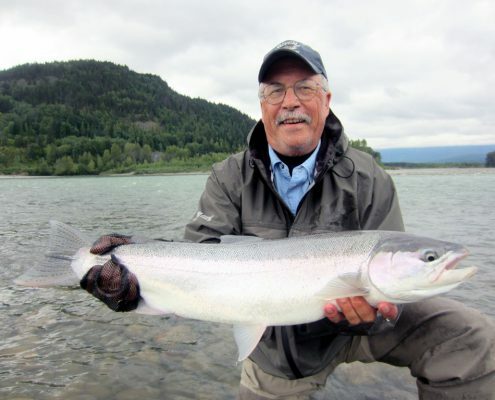 Our guests caught some nice fish this spring and we look forward to seeing them back again next year. 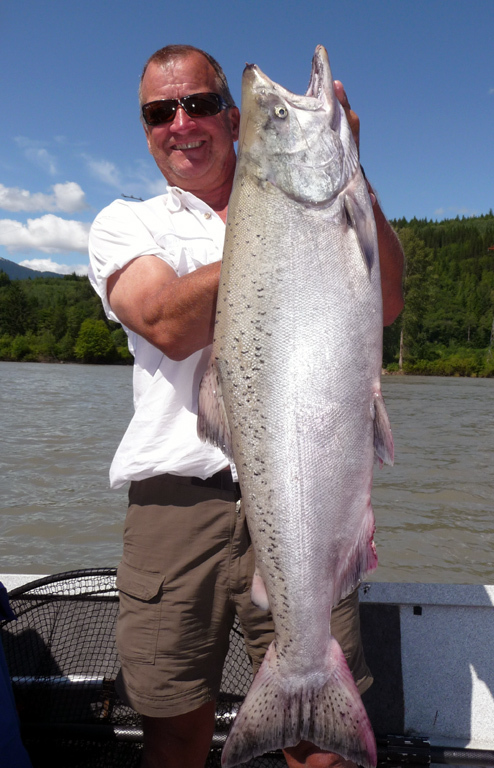 Chinook season is now upon us. 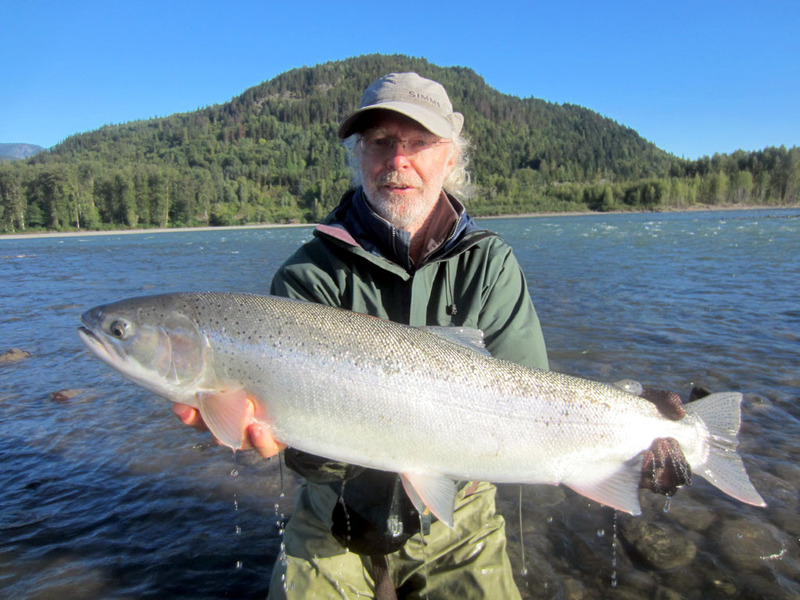 Last week our long time guest Michele landed a large silver Chinook from the Kalum River that nearly spooled him twice. We had another great day fishing on the Kalum river yesterday. 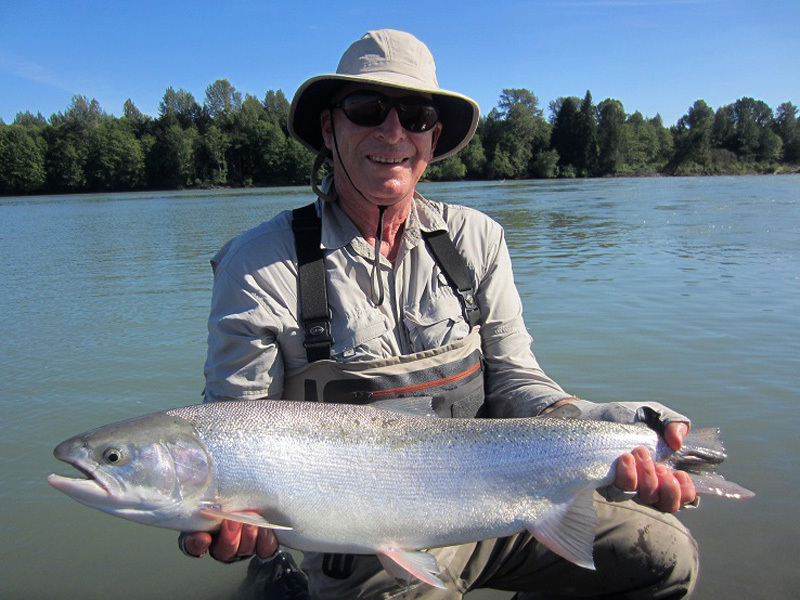 With warm temperatures and sunny skies it was a good time to be out on the river. 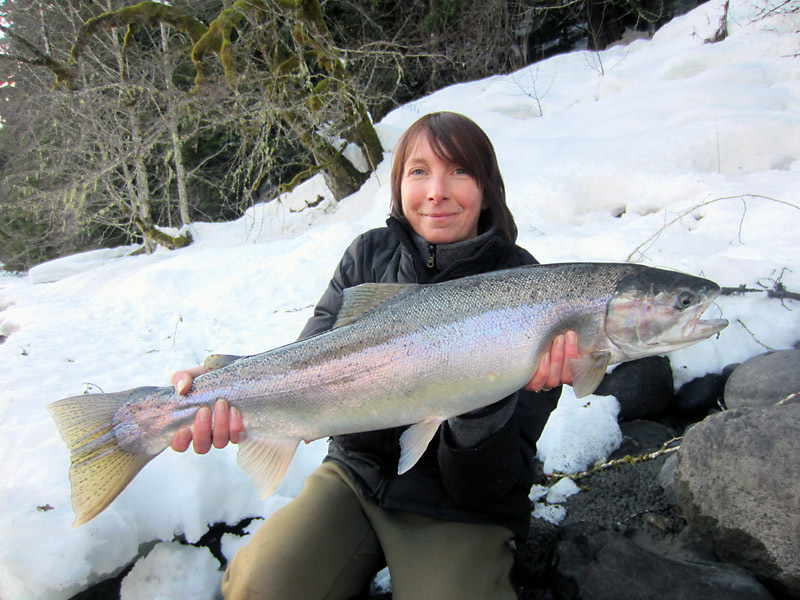 In just a few hours we hooked several Steelhead and some nice trout – here is Deanna with one of her Steelhead. Best wishes for the new year to all. 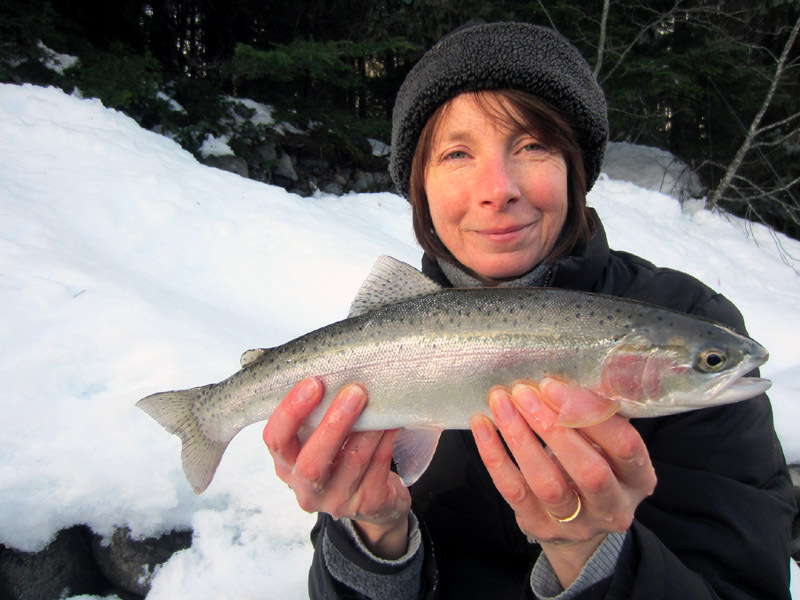 Despite the deep snow we have been out fishing today on the Kalum River, just a five minute walk from the lodge. 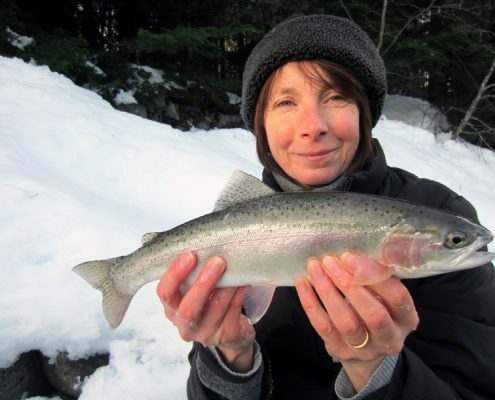 My wife Deanna caught several Dolly Varden and a Rainbow. I had one Steelhead on but it escaped before I could get it to the bank. 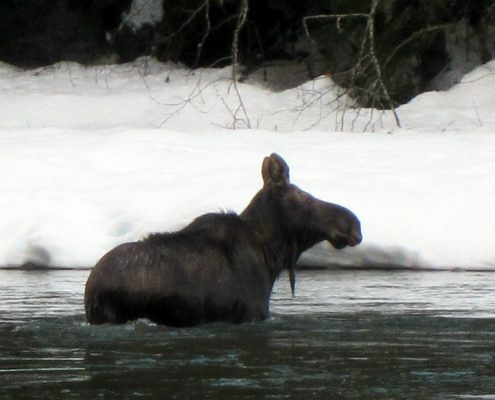 During our walk along the river we encountered a moose about 30 feet in front of us. 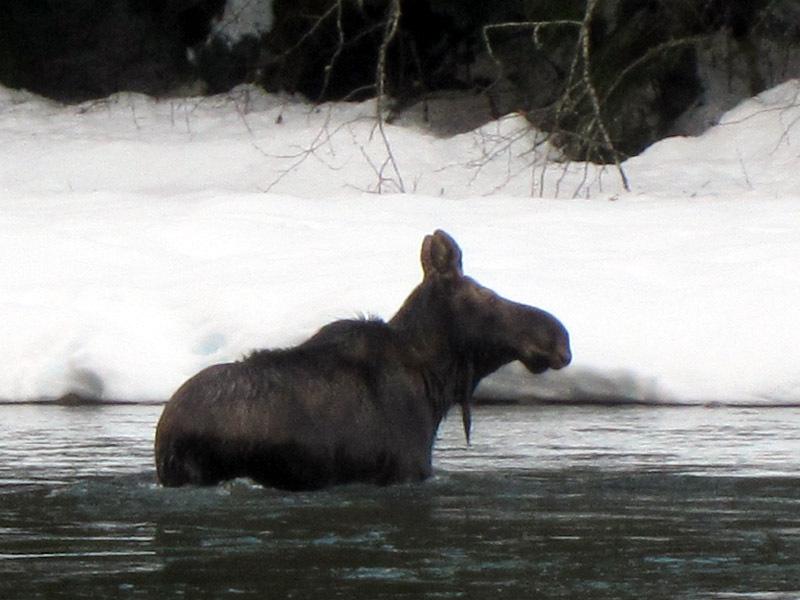 It turned and swam through the middle of the pool we were about to fish. 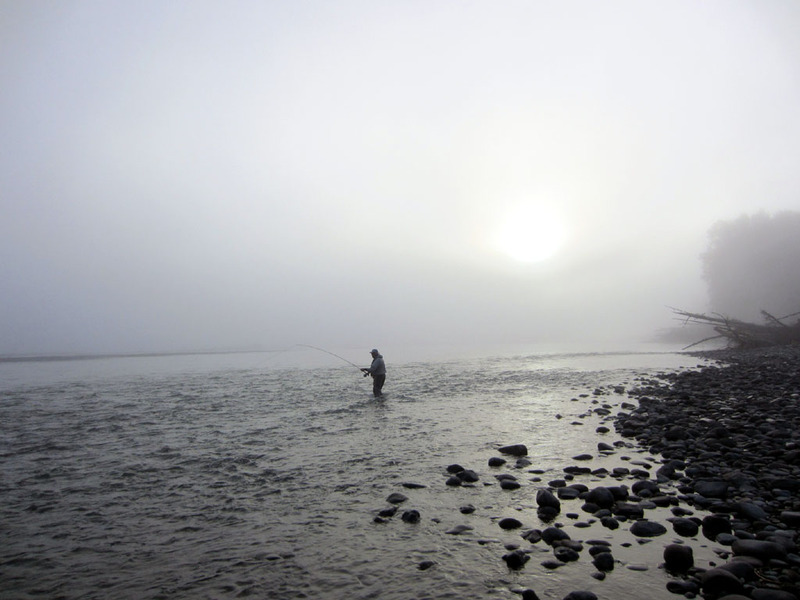 I snapped a couple photos as it reached the other side of the river. 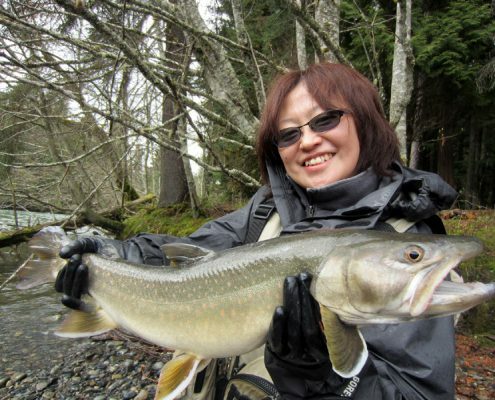 We are looking forward to our next day out! !